Decisions, decisions... I had one afternoon of free time to work on the project before the holidays. I had most of the parts for the DIY CNC, and the 5mm acrylic parts had also arrived for the alternate plastic version of the Moco head. I knew i couldn't do both in such a short time so i had to pick one. This time, i decided to have a go at the CNC mill, the reasoning being that if i got that working properly, it would help with the motion control stuff too. Better to have the tools than the product at this point. CNC mark zero point five. So i started to bolt stuff together. 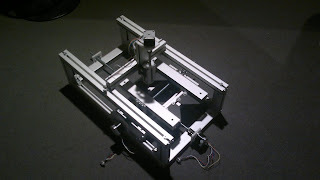 The CNC mill/3d printer/ whatever uses a lot of the parts from Halsugrip system - i had them readily available. It says something about the versatility of the aluminium profiles that it didn't really take that long before i had the frame done using the standard length pieces (i had done some testing previously which obviously did help). For the linear motion, i used sliding bits on the profile grooves, for now. Will see if that works for real. The linear motion in all axes is powered with Nema 17 stepper motors, which rotate M10 threaded rods. I bought the zero backslash leadnuts and threaded couplers from dumpster cnc. The quality of the parts seems to be very good. The only complain is that the couplers, while made for a metric system, use imperial hex grub screws for tightening the coupler to the rods and the axle. And of course, i have no imperial hex keys. I guess a trip to the hardware store is needed, or maybe i will replace those with my own screws. As far as the laser cut parts for the machine go, they're mostly 6,6mm delrin. Wised up from previous mistakes, i tried to make them as adjustable as possible - no exact positions for fixing screws but rather grooves where the screws can be slided around at least a little. Nevertheless, many parts didn't fit at all as is, i had to saw, drill etc. them to bolt my Frankenstein CNC together. Its surprising how despite checking measurements multiple times, and even making a 3D version of the finished gear to see everything fits together before ordering, when i actually get the stuff on my hands, it rarely works the first time. Just got a word from DHL that a package from Ponoko is about to arrive tomorrow, they wanted to know whether they would take care of the customs and taxes, or would i do that myself. I let them do it. So, tomorrow i'll get more parts - they come from Ponoko New Zealand (though i ordered from USA). I have only two orders in from outside the EU, so they must be either the steel or the delrin parts for the Moco rig. Either way is good, i get to play a little again. 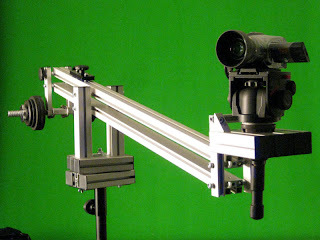 The motion control rig has very humble beginnings. As a proof-of-concept (and out of necessity), i made a quick time lapse camera rig two years ago from a RC toy car by changing the motor and modifying the transmission for very, very slow motion and stripping out the excess parts. 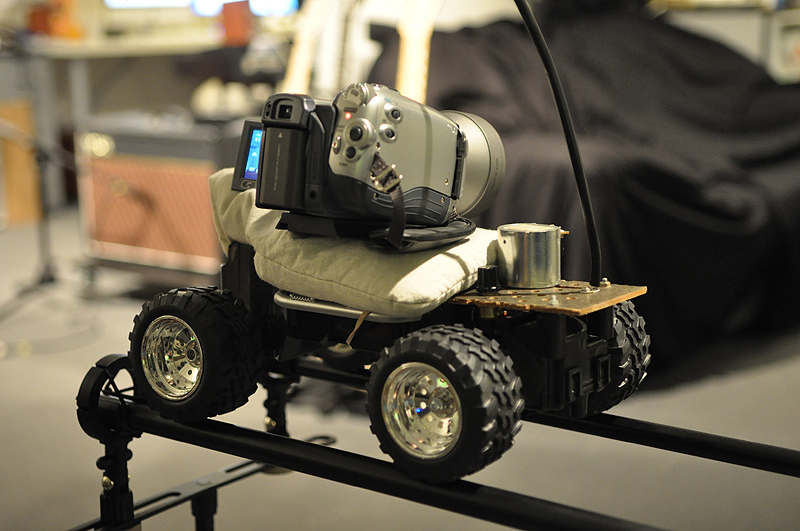 Then i just put a small sand bag on top of that, and let the camera rest on it. I used the crude proto to shoot an actual gig, Skanno's corporate video. I started with D90, but being hooked to a laptop for the time lapse trigger soon proved impractical (which reminds me, the Moco rig will need a still camera trigger option too i guess). For most shots, i used my trusty old HV20, a little HDV camera, sometimes with my DIY 35mm DoF adapter (built 2007). I just let it record for as long as i thought i needed the shot to be, then sped up the footage in post. I'm pretty happy with the results i got. Just a quick note, most of the electronics for the motion control dolly/head have arrived, as well as some of the laser cut parts, belts and timing pulleys etc. At this point, it will have three axes of freedom, track, pan and tilt. I spent better part of a day soldering etc. The basic setup seems to be ok now (at least everything powers up). I will test this as is when i get the rest of the parts, running under computer control. The standalone controls (also seen in the picture) can wait until i have everything else working properly. I'm using D9 sub connectors in many roles - they are pretty robust, and work well with pre-crimped cables and can even be soldered directly to boards - most of the connections will not be permanently soldered though, at least on this prototype, for easier debugging and maintenance. 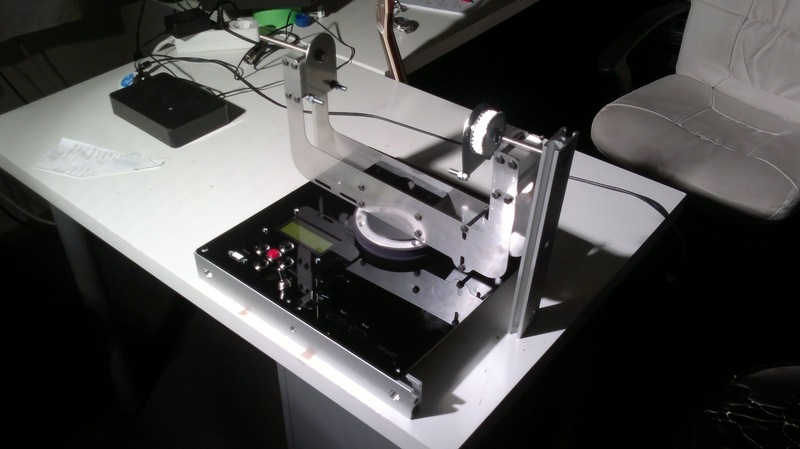 The electronics setup is rather similar to that of CNC mills/routers and 3D printers. I will need to write my own software though. But speaking of CNC, i ordered an extra set while at it, and will probably build my own CNC / 3D printer. So far, i have been ordering 3D printed parts from Shapeways and laser cut parts (plastic and steel) from Ponoko. While this works really well, everything can be done online, quotes are automatic and the quality is great, in the other hand it's not too cheap when the parts are largeish, especially with shipping... and it takes quite a while to get the goods. 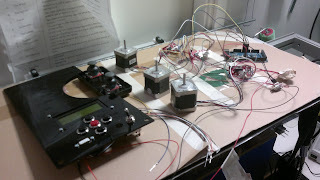 Having my own gear to make the prototype parts would make things move along much faster. Not so surprisingly, usually the first version of a part doesn't really work too well, it's the 2nd or 3rd generation that's, well, "ok". And between each iteration, there's a few weeks of waiting, not to mention, usually a few hundred more bucks spent. As a small rant, i'd really like to see similar online service as with Shapeways and Ponoko from Finnish companies - i'd like to get stuff done locally, but i do not want to call a sales representative just to know how much a square meter of 3mm aluminium costs. That stuff should be available online. Especially as i mostly work on this project after hours, and the question usually arises at 1 am. I've been in the business of making moving images for the last 20 years or so, be they actually shot or virtual ones. I've also always been interested in building my own stuff, getting by with scarce resources, using DIY and/or consumer equipment wherever it's suitable for the job. I'm not an engineer, but over the years i've built multiple edits, made a few greenscreen stages, written software and also made some minor gear to use on the shoots. Maybe two or three years ago or so, i started to look deeper into building my own tracks, dollies, jib and other camera gear, with the underlying idea to maybe make those into a real product line one day. The key point was to make the system as affordable and as modular as possible - maybe partly inspired by Red's new Epic and Scarlet cameras. The work-in-progress title for this line of gear is "Halsugrip" - hence the name of this blog. The journey is still underway and i'll try to share a bit of that trip here. The main building blocks of the system are aluminum profiles, normally used for making frames for industrial machines, conveyor systems etc. The profiles have multiple benefits: they're mass produced and thus relatively inexpensive, relatively light yet very robust and best of all extremely versatile. They have grooves that run through the whole length, and pretty much anything can be bolted on using standard M8 bolts and nuts. There will be a few standard profiles in various lengths with standard machining (cut to length, drilled, tapped), which can become parts of a jib, track, dolly, poor man's steadycam, motion control system... you name it. Of course, there will also be custom parts - while i consider myself very much a novice still, i've enjoyed learning a bit about gears, pulleys, bearings, CNC machining aluminium, 3D printing, laser cutting and casting plastic.. and also a little about programming for embedded systems. It seems the options are endless, the number of design decisions simply bewildering. Also, it's become painfully clear that getting the first somewhat working proof-of-concept prototype is often quick, easy and affordable, but coming up with a really good robust and versatile design that's worthy of showing to others is far from it. Welcome on board folks, i hope you enjoy the ride. As a teaser, this trailer was shot (with Red One) using my prototype dolly and track.